Where I got them: I got mine at Deal’s. Now that they’ve gotten so popular, you can get them pretty much anywhere hangers are sold. Why I love them: They’ve got such a sleek, smart design! 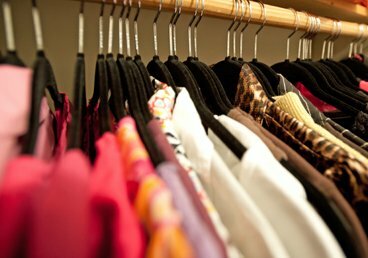 Upgrading to hangers made of a single color and/or material will give your closet a finished look and feel. So when I chose to swap out the mishmash of plastic hangers in my closet, I chose these. I love that clothes don’t slip off of them. It helps clothes retain their shapes (avoiding the shoulder bump thing!) They also take up less space than plastic or wooden hangers, which is great if you have a small closet or just want a little more breathing room on the clothes rack. And personally, I love the way they look, too. What kind of hanger do you like best? What a difference these hangers make! I switched about a year ago and was so glad that I made the investment. You’re right about saving space and making a closet look uniform and organized. I’ve been so tickled with how my closet looks and I love how organized it looks. Great job on your closet and love the shelves you choose to use and how much more space you utilized. Love the hats above the door. Thanks for sharing. Have a great weekend. I love these too but my husband doesn’t like them b/c he can’t slide his shirts off easily. I agree with Emily’s husband! I love the idea of these hangers, but I found them too annoying to use. I’m glad I only bought a few to try, instead of a full closet’s worth, as I had originally planned (thanks to a tip of Aby’s). The grippiness not only makes it hard to slide clothes off, it also makes it a lot more time consuming to put them on. On plastic or wood (or metal), the clothes slide into place; with these, you need to adust each item a couple of times to get it to hang properly. I use just a couple of these now for items that would otherwise slide off. But these just drove me too crazy to use for all my clothes. Thanks so much, Dottie! Emily, do you use them and put hubby’s clothes on other hangers? Nancy, you are correct that (like with soooooo many things) there’s a trade-off in using these hangers. It’s good that you know what your own needs are and have found the solution that’s right for you!